Sir George was the eldest son of the Rev. George Young of Bere Regis in Dorset, by his wife Eleanor, the daughter of Joseph Knowles. The Young family claimed descent from John Young of Buckhorn Weston, a Sheriff of Dorset in 1570. It is said that Young went to sea in the Namur with Edward Boscawen in 1746, in which case it would seem that he went out to the East Indies with Boscawen in 1747, quitted the service there, and joined that of the East India Company. On 20 Dec. 1757 he was discharged with credit as a midshipman from the Prince of Wales East Indiaman, and immediately entered on board the York as an able seaman with Captain Hugh Piggot (1721�92), and after six weeks was rated as a midshipman. In this capacity, he served at the Siege of Louisbourg in 1758, during the Seven Years' War, where he commanded a boat at the cutting out of the Bienfaisant of 64 guns, and the destruction of the Prudent of 74 guns, which was followed next day by the surrender of the place. An oil picture by Francis Swaine of this night engagement was painted from Young's sketch. In 1759, he was, again with Piggot, in the Royal William at the capture of Quebec. His passing certificate, dated 3rd September 1760, mentions only the York and Royal William, in addition to his certified service under the East India Company. On 16th November 1761, he was promoted to be lieutenant of the Orford, with Captain Marriot Arbuthnot, which, in February 1762, went out to the Leeward Islands in charge of a convoy, took part in the Battle of Havana under Sir George Pocock, and continued on the Jamaica station until the peace. Young was promoted to be a commander on 29th September 1768, served for some time on the West African station, where he was one of the explorers of the ancient burial sites on the Peak of Teneriffe, and brought thence a mummy which he presented to the library of Trinity College, Cambridge. In 1776, he went out to the East Indies in command of the Cormorant, from which, on 7th November 1777, he was posted to the Ripon as flag-captain to Sir Edward Vernon, with whom he took part in the Siege of Pondicherry in India, a Anglo-French engagement related to the American Revolutionary War on 10th August 1778. Young was then sent home with despatches, received the usual compliment of �0 to buy a sword and was appointed, in March 1779, to the William and Mary yacht. In this ship, he took the Prince of Wales to the Nore Sandbank at the mouth of the Thames when the King visited the Fleet under Sir Hyde Parker (1714�82) after the Battle of Dogger Bank during the Fourth Anglo-Dutch War on 5th August 1781. Young was knighted on 24th August 1781. Afterwards, he was moved into the Catherine yacht and, during the Russian armament of 1791, to the Zealous. 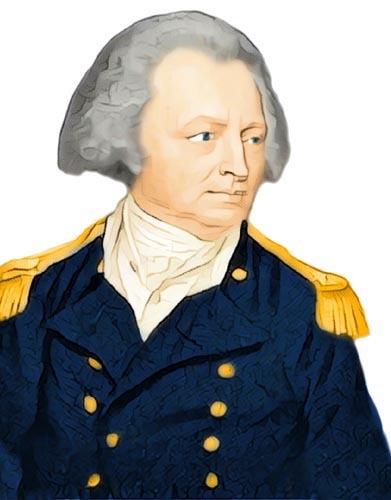 On 4th July 1794, he became a rear-admiral, vice-admiral on 14th February 1799, and admiral on 23rd April 1804, but had no service. In 1784, Young took up actively, in conjunction with Lord Mansfield, Sir Joseph Banks, Thomas Rowcroft and others, the proposal of Jean Maria Matra for the establishment of a colony in New South Wales. He wrote a paper containing a plan for this purpose which was, on 13th January 1785, communicated to Lord Sydney by Sir Richard Pepper Arden, the Attorney-General, and became, with that of Matra, the basis of the official scheme on which the expedition of Governor Arthur Phillip was started. The value of Young's paper consists in its practical details. His two principal suggestions of an original nature - one for making the settlement a port of call for the China ships, the other for the cultivation there, in the interest of the Navy, of the New Zealand flax-plant (Phormium tenax) - remained without fruit. In 1788, Young, together with his associate, John Call, applied to the Colonial Office for a grant of Norfolk Island, which had, however, been just taken up for settlement. In 1791, he was also a promoter and one of the first proprietors of the Sierra Leone Company. In 1792, he was examined before the bar of the House of Commons on the African slave trade and gave evidence of its evils, no less valuable because it was temperately worded. He filled for the first ten years of its existence (1786�96), the post of treasurer to the Board of Commissioners of the Thames Navigation. Young died at his country seat, Formosa Place at Cookham in Berkshire, on 28th June 1810. He was a Fellow of the Royal Society (elected 15th February 1781) and Fellow of the Society of Arts, a fine vocalist, and an amateur musician. There are excellent stories of his good manners and accomplishments, and he described him as "remarkably handsome". He married, first, Elizabeth, the daughter of Samuel Bradshaw of Great Marlow in Buckinghamshire, and had issue by her, two daughters and two sons, the elder of whom, Samuel, was created a baronet in November 1813. His second wife was Anne, daughter of Dr. William Battie of Bloomsbury. Edited from Sidney Lee's "Dictionary of National Biography" (1899). � Nash Ford Publishing 2013. All Rights Reserved.